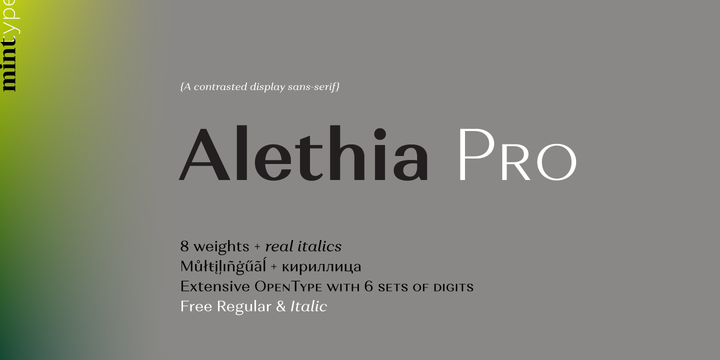 Alethia Pro is a contrasted display sans serif typeface created by Oleh Lishchuk and published by Mint Type which is available in 8 weights (from XLight to Black) with accompanying italics, a wide range of OpenType features and multilingual support. It merge well on various purpose from display, editorial project, magazine to corporate brochures etc. Price: starting from $30 for one font to $280 for all 16 fonts. A font description published on Monday, December 12th, 2016 in Fonts, Mint Type, Oleh Lishchuk by Alexandra that has 2,125 views.